Bring a large pan of salted water to the boil and add the pasta. While the pasta is cooking, heat the olive oil and gently fry the garlic. Try not to let it brown - turn the heat down if necessary. Add the courgette ribbons and salt to the garlic, stir, and cook for a few minutes until they collapse. 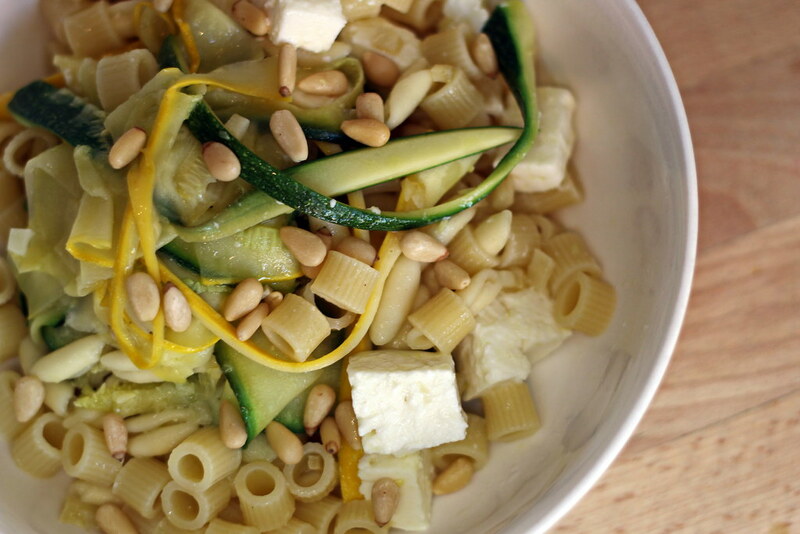 By this time the pasta will most likely to cooked, so drain it and add to the pan with courgettes. Stir, and divide between two bowls to serve. Top with a scattering of pine nuts. Enjoy!